Welcome to Tarbert Loch Fyne the picturesque fishing village in the West of Scotland..
Tarbert Loch Fyne is an idyllic Scottish village also known as the gateway to the beautiful peninsula of Kintyre in the south west portion of Argyll, Scotland. The shops, pubs, hotels and houses settled snuggly around Tarbert's welcoming once entirely natural harbour, one of the very few in Scotland. Tarbert has a great selection of accommodation, view Tarbert Hotels, Self Catering and Bed and Breakfast here in north Kintyre. Tarbert is the last stop before the Islay ferry service and popular with overnight visitors before their journey to the Whisky Isle. Most Bed and Breakfasts in Tarbert provide early morning breakfasts and transport for the early Tarbert to Islay ferry which is less than 10 minutes by car on the way south to Campbeltown. 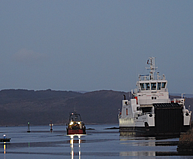 The other ferry to Portavadie, Cowal departs from the village daily. 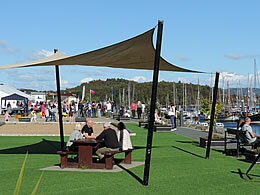 Tarbert hosts and delivers a number of well established community events each year including the popular Seafood and Music festivals. The community Christmas event is the most recent addition to the villages events calendar and provides a warm up for the festive season. The Scottish Series, Britain's second largest yachting regatta is held every May with competitors from all around the UK and abroad, whilst the shoreside facilities have declined significantly from its peak a decade ago the event still attracts large numbers of competitors. The village of Tarbert Loch Fyne draws visitors from all over the world, renowned for Tarbert Castle, associated with Robert the Bruce, that overlooks the clear harbour waters. 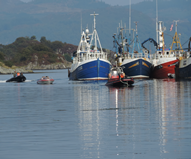 Tarbert is also renowned for some of the finest, freshest and tastiest seafood money can buy and remembered for the superb events and festivals that happen annually including the Scottish Series Yacht Race, Tarbert Seafood Festival and the Tarbert Music Festival. Nick Nairn has been a supporter and previously a regular attraction at the annual Tarbert Seafood Festival across five fantastic years, the event remains although now returned to a more community based affair. Tarbert, at the very north tip of Kintyre gives you superb access to all the ferry points across Kintyre, that travel to Gigha, Arran, Islay and Portavadie and gives you excellent access to all the locations of interest from Kilberry, the islands such as Jura, Islay, Gigha and Arran, the main road to the Mull of Kintyre and the main road in the other direction to Oban, and further on to Fort William. The village at heart is a working fishing village landing catch almost daily and certainly every weekend, but is surrounded by areas of natural beauty and conservation. It is a special place to both live and work and the community achieves a great deal during the course of the year. There are many organisations and clubs, such as Tarbert Youth Group working with the young and underpriveleged to Tarbert Bowling Club which has been here for many many years, and also Tarbert Football Club which is achieving some success in the sport. Tarbert has it's own golf club just a kilometre south of the village. Tarbert is the perfect short stay location for access to the ferry services in the area and the final stopping point before the Islay ferry from Kennacraig. 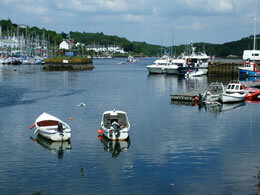 Tarbert is also great as a location to stay for holidays to explore the village and Kintyre. 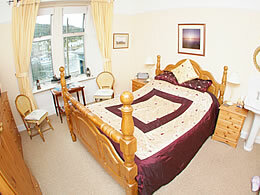 Most Tarbert B&B accommodation will provide early breakfast and transport to the early ferry due for Islay. 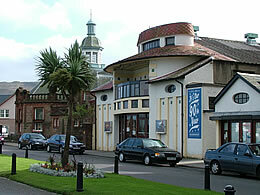 Tarbert is only a 10 minute drive from the Kennacraig to Islay ferry. For information on hotel, self catering and bed and breakfast accommodation available in Tarbert Loch Fyne please view the Accommodation section. 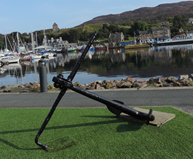 Tarbert has a long standing history with fishing and continues to operate a small fishing fleet along with potters that catch shellfish using kreels. Whilst much of the produce is exported to the continent, Tarbert is still a unique place offering accommodation and great eating places all set around the wonderful natural harbour and with wonderful light and views. 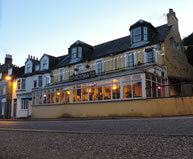 To find out more about the best places to eat and drink please view our eating out section here. There are a number of short walks around the village and slightly further afield, from a quiet stroll along the Pier road, a jaunt to the White Shore, or a hill walk through forestry with stunning biews. 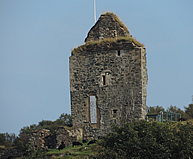 If you enjoy long distance walks, the start of the Kintyre Way walk is here in Tarbert by Tarbert Castle, the first stretch of the Kintyre way uses the existing Tarbert to Skipness walk and the early part gives you superb views up Loch Fyne towards Lochgilphead. The walk criss crosses its way through towns throughout Kintyre including Campbeltown, Machrihanish, Tayinloan and Carradale. 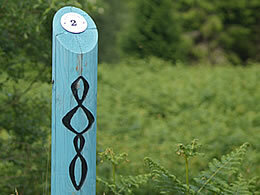 Discover more about walks and cycling with the outdoor explore section here. Kintyre is the long narrow peninsula that affords mainland access via ferry to the stunning Islands such as Arran, Islay, Jura and Gigha. The peninsula of Kintyre is roughly 40 miles long containing rugged but stunning coastline, some small and quiet sandy beaches, forestry, hills and picturesque walks. Alot of the land here is farmland, more so towards Campbeltown and Southend, where there is a high dairy production of creams and cheeses. 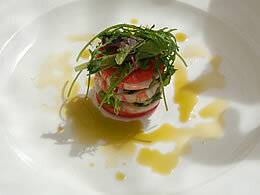 Of course Kintyre is not only famous for cheese, malt whisky and seafood. Kintyre is also home to the Machrihanish Golf course, a championship quality golf course, one of many quality golf courses throughout Kintyre and Argyll. These include Tarbert Golf Club, Dunaverty Golf Club and Carradale. From the southern tip of Kintyre, also known as the Mull Of Kintyre, made famous by Paul McCartneys 1977 number 1 hit single, you can on a clear day see the northern tip of Ireland. In fact on a good summer's day you can see Ireland as you travel southwards towards Campbeltown on the west side of the peninsula. Kintyre on the whole has interesting geology, archeology and ancient history. 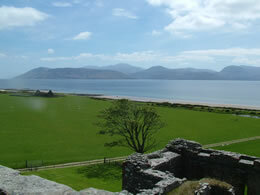 Ruined castles are located at Tarbert and Skipness, with another at Dunaverty. Burial Cairns and standing stones are to be found across the landscape and many places of interest lay in wait for your discovery. 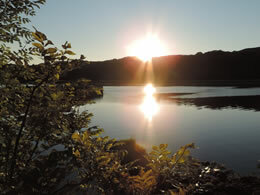 Kintyre is a stunning part of Scotland, encompassing more than the sum of its parts in terms of interest and quality. What better way to see all that Kintyre has to offer, than to use Tarbert as your holiday base with access to all the islands and the east and west coasts of Kintyre. 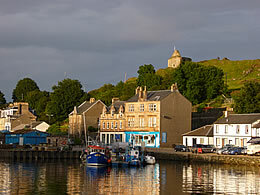 Tarbert, also known as Tairbeart in past times, really will make your stay one to remember.